Handwritten Chinese characters can be magically beautiful and mysterious. I still remember what it felt like looking at Chinese and not understanding anything of what it said and feeling a strong attraction. Indeed, some students start learning Chinese because of the characters. After having studied Chinese for a while, I realised, just like all other students before me have, that handwriting in Chinese takes a very long time to learn. It’s not like learning another alphabet or anywhere nearly as simple as that. It takes many times longer than simply learning to read, which is not true to the same extent for other languages. Is it really necessary to learn how to write by hand in Chinese or is reading/typing enough? When was the last time you wrote something in English by hand? Being able to do these things in Chinese is not enough to motivate that you spend hundreds of hours learning how to write all the characters you know how to read. This doesn’t mean you should skip handwriting altogether, though. Let’s look at this a bit closer. Whatever you think about the need to able to write complicated texts in Chinese, I think most people agree that you should learn to write characters when you start learning Chinese. Not necessarily straight away, but if you hope to become literate in Chinese, you definitely need to know the basics of handwriting. Without it, it will be very hard to decipher characters and know how the components work and how they fit together. You don’t need to be a calligraphy master, but you do need basic handwriting skills to do this. This number of characters you should learn to write by hand is slightly arbitrary, but I think learning the most common 1000 characters or so is a good idea for all students. Learn characters outside the 1000 most common on a need-to-know basis (such as your country, your name, your address and so on). If you find that you don’t particularly like writing much by hand, then don’t, but learning 1000 guarantees that you can manage basic communication in written Chinese, which might be essential at times. Sure, you won’t be able to pass an academic exam with 1000 characters, but that’s not what you’re aiming for. In other words, learn handwriting to enhance your understanding of Chinese characters, not because you need the handwriting in itself. Communicating with Chinese friends and relatives – This almost certainly requires no handwriting ability at all. You might be required to understand other people’s handwriting, which might cause problems. This is a bit off topic, but an advantage of learning to write by hand yourself is that it becomes much easier to read other people’s handwriting (you learn the stroke order, which is essential if you want to make sense of cursive writing). still, learning to write additional 3000 characters is a very bad investment compared to spending that time on other things. 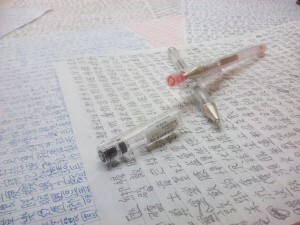 Studying something other than Chinese in China – If you want to pursue higher education in China, you will probably need to be able to write by hand as well, because your tests might be in Chinese. I know that some institutions allow foreign students to write in English, but I wouldn’t bet on it. 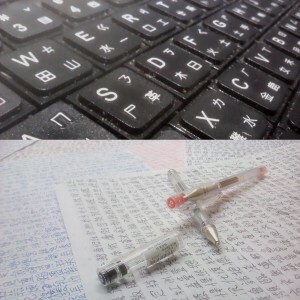 If your education is in any way related to the Chinese language, you will definitely have to be able to write by hand. Teaching Chinese – This is the obvious case where you really need to learn how to write by hand. I don’t think teachers necessarily need to write beautiful characters, but we need to be able to write correctly and clearly so that students can see what we’re doing, even if they themselves aren’t focusing on handwriting. Working in China –Let’s say you want to work in China, but with something other than Chinese (engineering, computers, whatever). Being able to write Chinese by hand is probably good, but it’s not likely to be crucial. Being able to speak, listen, read and type will be much more important. Again, note how your long-term goals dictate how and what you study. There is no simple answer to the question posed in the opening of this article. One advantaged with handwriting over mere recognition is that you have to be more active when you write. Thus, it’s easier to focus on character components and their relationships to each other. If you merely read, it’s easy to view the whole character as a unit, which is very efficient in the short term, but dangerous in the long run when you start encountering similar characters (you will confuse them). However, this isn’t really an argument for more handwriting, but rather a call for students to be more active when reviewing vocabulary (especially individual characters). Don’t just look at the characters and say “I know this” and click “next”, instead, process the different parts, put them together to form a meaningful whole. This is easier when writing, but it can be done without using pencil and paper. I will develop this in a future article. It takes a long time to learn thousands of characters, but it’s not an impossible task that takes years, especially if you already know how to read the characters. I think it’s perfectly possible to keep handwriting to the most common characters and then wait and see what happens. If you decide to become a teacher or want to do anything else where handwriting is needed, it will take some effort to learn how to write, but it’s not impossible. I think this is the best way because it minimises the time wasted on something you’re not going to use in case you don’t need handwriting. I learnt how to write all the characters in a textbook series by hand (approximately 2000 characters), which was enough for quite some time (roughly four years). During this time, I increased the number of characters I could read and understand to well above 5000. A few months ago, I decided it was time to start learning to write more by hand (upcoming exams, the need to take lecture notes better and so on). I’m currently going through my entire Anki deck in order to learn how to write most words and characters by hand. This will take a very long time indeed, but how to actually learn to write by hand will be the focus of an upcoming article; stay tuned! Thanks for the article, I liked it. So you know MORE than 5,000 hanzi? That’s insane! How many do you know exactly? (passive recognition / can write at least mentally). How did you get to learn so many, is that really the number of characters you encounter if you read a lot? I have a confession to make. I finished learning the 2,000 most common characters for Japanese almost one year and a half ago now. Even when I was learning, I wrote by hand most of them only one time. But the worst thing is, since then, I never ever wrote a single word of Japanese by hand… My handwriting must be terrible. I probably have one of the highest (knowledge of Japanese)/(characters written by hand) ratio ever… And for Chinese, well, the sole character I ever wrote was 你, I believe… How bad is that. (However, when SRSing my characters, I ALWAYS write them in the palm of my hand with the finger (mostly in the subway, ahah), and according to Anki, that’s 32,120 finger-written characters as of today, so I’m probably not completely bad at that little game… Rather than now knowing, it’s more like the proportions would be weird if I used a pen). I plan to work on by handwriting skills one day, but that’s really, really low on my priorities. I just can’t feel this same “urge” that I have to learn more vocabulary, more grammar, read and listen more. If you read reasonably often and read different kinds of texts, I think you get to 5000 without trying very hard (meaning that you don’t have to really look for hard characters). However, after this I’ve found that you either need to start reading things with lots of 成語, texts with specific vocabulary or with lots of place names. It seems like most new characters I see that I don’t already know at least passively are either names of places or food. I usually don’t bother to learn those unless I have a specific reason. I think I know about the same amount of characters as you (around 5,000); have you noticed how the only new characters now are in place names and given names? It’s incredibly frustrating that I can read aloud every character in some text, but then when it comes to a person and his village’s name, there will be some crazy, ridiculously uncommon character. Memorizing and retaining them is also not easy, since they have no surrounding context of worth. When I’m learning a new word, I usually start out by writing the new character five times and saying it out loud. Subsequently, each day, I write out the entire list of new words strictly from memory, without looking. If I forget a word, I review the dialog that goes with the vocabulary list and see if I can recreate it from memory and dredge up the forgotten word that way. Any words I just can’t recall, I write five times on that day to try and remember them better for the next day. By the end of the week I’ve usually got pronunciation, meaning, character recognition and writing fairly solid on about 10 minutes a day. I still find I have to go back and review from time to time, as small pieces of a character fall out of memory, but that review seems to solidify and put things into a long-term memory at that point. I personally think the writing really does help distinguish similar characters from each other, as well as helps put the character into more long-term memory. If I’m struggling to remember the character, sometimes if I just write it on a piece of paper, the muscle memory and stroke order kicks in for me, and it suddenly comes right out. If I just look at characters (tried that early on) they more easily evaporate or get confused with others. Maybe it’s just me, I am after all only a beginner, but I don’t find learning to write them taking any more time than learning them period since I combine them all into the one exercise. I agree with you that learning characters to write characters above a certain set to start with is probably not a good investment of time. Nevertheless, I’ve always loved writing characters itself, no matter how limited the use. Brilliant, thoughtful post. I’m really curious as to how handwriting skills are changing in China now that there are so many apps and other ways to write. A project of mine here is finding the remaining brushmakers in China, and the ones I’ve met all complain that no one uses brushes every day, so it’s no longer a good way to earn a living. This area is one that I’ve personally had several different opinions on over the years. For the first few years at school, we had to handwrite everything. Personally, I thought all the time spent learning characters would have been better spent I the other foundational areas. While I can read around the three or four thousand character mark, I can only write about 1200 by hand. Still, as a personal goal I want to be able to write about 6000 or 7000 characters. As for students, I think addresses and locations are probably the only thing that one absolutely needs to learn to write. Still, good luck on the quest for an answer. I agree this is an important question to confront maybe at various points in one’s Chinese learning ‘career’. I don’t do much of any writing these days. I do remember fondly when I was copying sentences by hand somewhat regularly as a way to practice not just writing, but other skills too. Because writing slows you down, the sentence I was copying – the sound of the sentence as if they were spoken – would repeat naturally in my head as I would write. I felt I was internalizing language this way. And I find it peaceful and meditative to copy sentences. I agree with this article, and wouldn’t object to someone feeling writing is dispensable. At the same time, I would be surprised if you could find a student of Chinese who spent a lot of time writing and feels regret about it. I don’t have a Reddit account, so I am going to post my own answer to the ‘you should learn handwriting to improve you ease in reading’ argument. When I was a beginner, I did invest in handwriting. I never was able to hand-write more than 500 characters, but that was enough to get the principles such as ‘radicals’ and ‘stroke order’ down. It’s been so long since I’ve practised that the character I can hand-write from memory now is probably much lower. I am pretty comfortable with using a stroke-based paper dictionary even with my atrophied hand-writing skills. I can read most kinds of fiction at about 80-90% of the speed I would read the equivalent text in my native language. If I tried to read a financial analysis in Chinese, that percentage would be much lower, but I think the way to fix that would be to improve my financial vocabulary and actually read a financial analysis or two in Chinese, not work on my hand-writing. I think hand-writing is a worthy skill in its own right, and I actually would like to return to it when it is a higher priority for me. However, I think the ‘without hand-writing you won’t be able to read Chinese with ease’ argument is rubbish. If one’s goal is to read Chinese with ease, my recommendation is to read 100 bloody pages of Chinese per day (or if that’s unrealistic, work oneself up to the point that it is realistic). Thanks for analysing this aspect of Chinese. Very good article3. I am finding that when you are in meeting or in class (on any subject) it is more efficient to take notes in the language spoken rather than translate what is being said into English. I am wondering if takes a long time to learn to take notes in Chinese to the extent you can do so without having to think too much. Or is it the case that there will always be some characters where one has to stop and think oh how do I write that and by that time the topic has moved on. Whereas in other languages you can always down write the word and look it up later, but at least the notes will be clear. I don’t know. I’m sure you can learn to take notes without too much problem in Chinese, bit I usually don’t think it’s worth it, just takes too much time to write. It’s not that I don’t know the characters, it’s just that I haven’t written enough to be able to take notes continuously while focusing on what the lecturer says at the same time. I take notes in a mixture of languages: Swedish, English, Chinese (both pinyin and characters). I think being able to write things down in several languages is an advantage and I don’t really see why taking notes in English would make the notes less valuable, provided that you know the relevant vocab in both languages. Also, a significant part of the academic literature is actually in English anyway, so even if the lecturer speaks Chinese, it makes sense to take notes in English. You are probably “write”, one could take notes but it would take a lot of time to practice for it to become second nature as it were. I am finding it takes longer to write in Chinese so that even translating into English and writing it in English is quicker, and even that can be a long process during which you are trying to understand contents. Note taking is probably a skill too. I don’t really practise character writing but I do know the stroke order. I currently live in Hangzhou where none of the taxi drivers speak English and don’t know pinyin as they didn’t grow up with that. By far the most crucial reason for me to know how to write characters is when I see my phone is about to run out of battery. I write down the place name, my phone dies, I show the note to the taxi driver and all is well. Apart from dead battery, I’ve found little use for character writing. Great article for any learner and teacher. 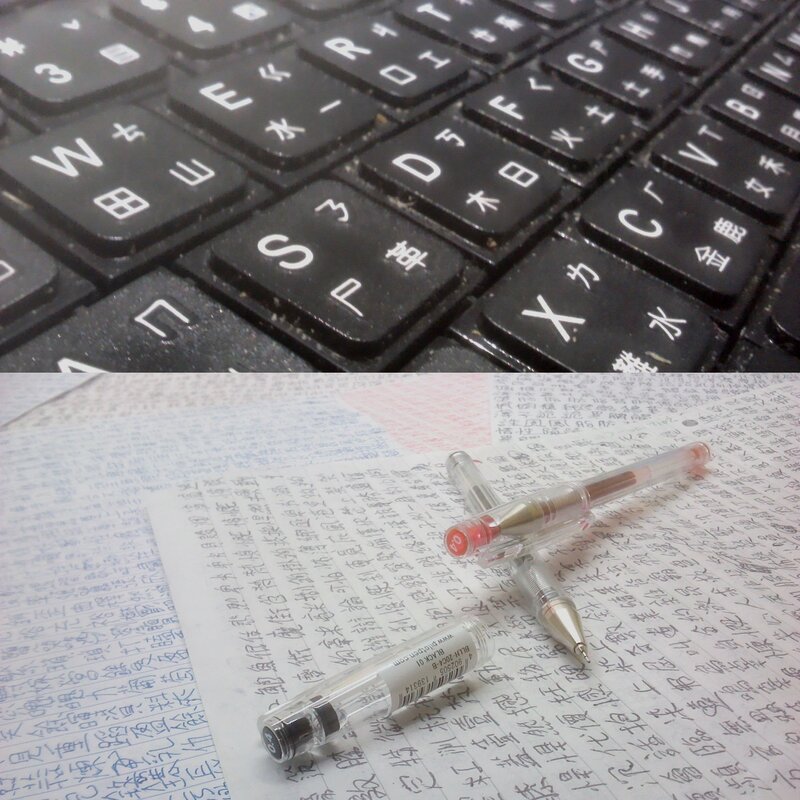 First, How long ago did you started thinking really about to write or not the Chinese characters? And, for a beginner what do you recommend, even though they really don’t know at this time their goals and how long will they learn? Myself, I study Chinese sinc.e 2008, and also know Armenian, Spanish, Portuguese, German , English and some French. I’m looking forward to keep learning and know have the opportunity to teach Chinese as a foreign language but, more than 5 different jobs requests all demand me not to teach Hanzi, characters and to write. They say is useless for they employes to learn handwritten language, but I don’t agree. What do you think is the best outcome teaching only by pinyin? I’d like to point out that you do not need to learn to write by hand if you want to pass the HSK 6. Just find a test center which offers the internet based test, there you’ll be able to type (using pinyin input method). I learned this today and it blew my mind. I’ll now first learn how to read and learn the hand writing later at a low pace.